To prevent components from becoming corroded or worn, they are often coated using hexavalent chromium. Starting in September of 2017, though, this will only be permitted with exceptions. The extreme high-speed laser material deposition (EHLA) developed by Fraunhofer and RWTH researchers offers an economic alternative for the first time ever. Whether in the automotive industry, machinery and plant engineering or aerospace, numerous metallic components have to be protected against corrosion and wear. A common method to accomplish this is hard chromium plating. However, this method has serious disadvantages: Not only does it consume a great deal of energy, but the chromium(VI) which is used is also highly damaging to the environment. As of September 2017, it may therefore only be used upon authorization/approval. This ban presents the industry with enormous challenges. Dr.-Ing. Andres Gasser and Dipl. Thomas Schopphoven from the Fraunhofer Institute for Laser Technology ILT in Aachen and their colleague Dipl.-Ing. Gerhard Maria Backes from the Chair for Digital Additive Production of the RWTH Aachen University have now developed an economical alternative: extreme high-speed laser material deposition or EHLA for short. This process not only offers companies a way out of the ban dilemma, but also provides significant advantages to hard chromium plating: No chemicals are used – which makes the process very environmentally friendly. The resulting layers are dense and can therefore protect the component from corrosion and wear more effectively. In addition, the coating is bonded to the base material in a material-locking manner so it cannot flake off, unlike the case with hard chromium plating. Various materials can be used for the new coatings, such as iron, nickel and cobalt-based alloys. The new process is also attractive compared with thermal spraying – another common way of producing coatings: Because about 90 percent of the utilized material reaches the place where it is needed, instead of only about 50 percent. This makes the process far more resource-conserving and, therefore, significantly more economical. “With the EHLA process, we can finally apply thin layers in the tenth-of-a-millimeter range to large areas in a very short time and in a manner which is efficient in terms of resources,” explains Dr.-Ing. Andres Gasser, who heads the Laser Material Deposition Group at the Fraunhofer ILT. EHLA is based on Laser Material Deposition, which is used to produce high-quality coatings for various materials. 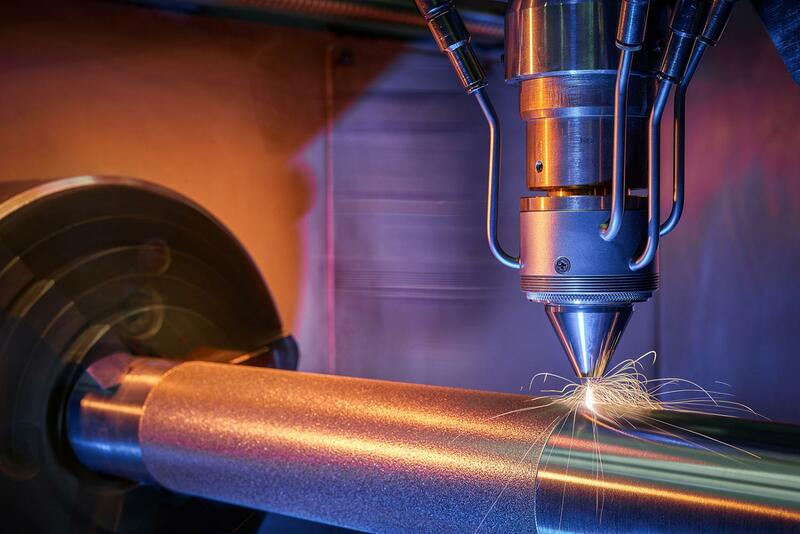 As far as wear and corrosion protection is concerned, though, conventional Laser Material Deposition has so far only been possible in isolated cases – it is too slow. “With EHLA, we can coat the component at speeds that are 100 to 250 times higher than those used in conventional Laser Material Deposition. In addition, it barely heats up. This allows us to coat heat-sensitive components as well,” says Dipl.-Ing. Gerhard Maria Backes. Further advantages: The resulting layer is purer and more effectively protects against corrosion. In addition, completely new material combinations are possible, such as coatings on aluminum or hard-weldable cast iron alloys.